Sister companies Eurotek Ireland and Avtek Solutions, market leaders in the visual communications sector, have amalgamated to operate under a single name - Ion Solutions (EMEA) Limited. The merger has seen an initial investment €150,000 into the new brand, which intends to engage a strategic growth plan consisting of organic development, acquisitions and new market entry. The new company, which will set new standards in the global visual communications industry, is 100% Irish owned, headquartered in Sandyford, Dublin and has grown to employ 62 people. €150,000 has been invested in the development and rollout of the new brand, which came into effect on 1st January 2018. Over the next 18 months, Ion Solutions will engage in a strategic growth plan that involves organic development, acquisitions and entry to a number of new markets. Eurotek was established 50 years ago and focuses on the design, supply, installation and integration of audio visual communications equipment, broadcast television systems, digital video production systems and computer graphics systems, as well as digital signage and wayfinding solutions. The company works across a variety of sectors including healthcare, broadcast, retail, hospitality and educational facilities as well as corporate venues. Clients include RTÉ, TV3, Kerry Group, Croke Park Stadium and The SSE Arena. Avtek Solutions, formed as a separate entity in 1994, provides creative and technical delivery of indoor and outdoor live events, conferences and exhibitions. Clients include Fáilte Ireland, Huawei, Toyota, Nissan, the Aviva Stadium and the RDS. The company also provides services to large scale events such as The National Ploughing Championships, Cruinniú na Cásca and the Dublin Horse Show. With an increasing overlap in the services provided by the two companies over the last number of years, a decision was made to combine the wealth of expertise, talent and skill sets across the two businesses to create one unified brand - Ion Solutions. 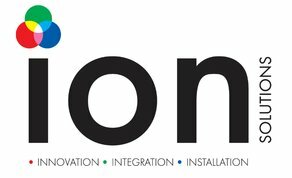 The existing management and operational teams will remain in place and, with the business now working under a single unified structure, Ion Solutions will focus on continuing to provide excellence in the delivery and management of visual communications solutions across the entire business spectrum.